Have you noticed, dear brethren, how the Church ties in our lives with church life, with events in the life of Christ? During the days of Christ’s Nativity we knelt before the manger of Christ, we became the sons of God. Then, beginning the civil New Year, a new circle of time which brings us ever closer to eternity, we were summoned to renew ourselves too, to renew our souls, cleansing them of sin and passion, to renew our hearts, filling them with virtue and love for God and our brethren. And now today the Church calls us to the shores of the river Jordan, where the great sacrament of Theophany, or the appearance of God, will be revealed to us. Today, dear brethren, we are celebrating the great feast of the Baptism of our Lord Jesus Christ. And we must understand it properly, we must properly prepare ourselves. This sparse description reveals to us, however, the depth of our salvation. First of all, for the first time in the history of mankind, the Lord God shows Himself fully – that is, openly reveals the mystery of Himself as God the Trinity; for this reason the holiday is also called Theophany. And now, in the New Testament, the Lord finally reveals Himself openly – in the feast of Theophany we witness the Trinity: God the Father gives His blessing from heaven, God the Son is baptized for our salvation in the river Jordan, and God the Holy Spirit descends as a dove – the symbol of meekness and purity. In the feast of Nativity the Church pointed out to us, that since the Saviour of the world has been born on earth, there is salvation for us, we all have the opportunity to be saved. 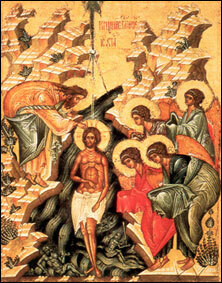 Now, in the feast of Theophany the Church shows us how to achieve this salvation: just as people once came to John the Baptist, were baptized in the waters of Jordan and were cleansed of their sins, so we should come to the church of Christ and purify ourselves through church sacraments. And in order to help us, and also as tangible proof of the grace of God, there is the great blessing of water on the feast of Theophany. By His Baptism the Lord Jesus Christ drowned our sins and blessed the very element of water. Thus, when the priest blesses any water, the grace of the Holy Spirit descends upon it, and this formerly plain water becomes a source of healing and salvation for us, and when we are baptized – it even washes away our sins. But the rite of blessing water in honor of the Lord’s Baptism is called the Great Blessing of the Water because of the truly great power which epiphany water possesses. While blessing this water and summoning the unique grace of the Holy Spirit upon it, the priest prays that all who drink this water be cleansed in body and spirit, that they be healed of illness, and that they keep this water for the blessing of their homes. Make sure to come to church, dear brethren, on the day of the Baptism of our Lord, in order to become participants in the great mystery of the revelation of God as Trinity, and in order to receive the visible grace of epiphany water. Amen.